Many people have a love/hate relationship with monopods. I bought my first monopod about 10-years ago, used it once or twice and then sentenced it to the back of my closet. It wasn’t until I started shooting video with the Canon 7D that I found a new purpose for it – as a inexpensive camera stabilizer. Since then, I have learned to use a monopod when tripods were not possible or practical. For example when I was following the cast of Glee the first day, I was exhausted after hand-holding the Sigma 50-500mm for 8-hours straight. Knowing the crazy crowds, a tripod was just not possible. Security was also very strict and chances are they would have insisted on removing a tripod anyway. The next shoot, I decided to bring my old monopod. What a difference! Induro CM25 Carbon Fiber 8X CM-Series 5 Section Monopod. CM-Series monopod is made with magnesium alloy components and 8X layer Carbon Fiber tubing which is 60% stronger overall than conventional carbon fiber tubing. Large rubber grip leg lock make adjusting and tightening the monopod quick and secure. Non-rotating leg sections (similar to Gitzo) make the setup quick and easy. 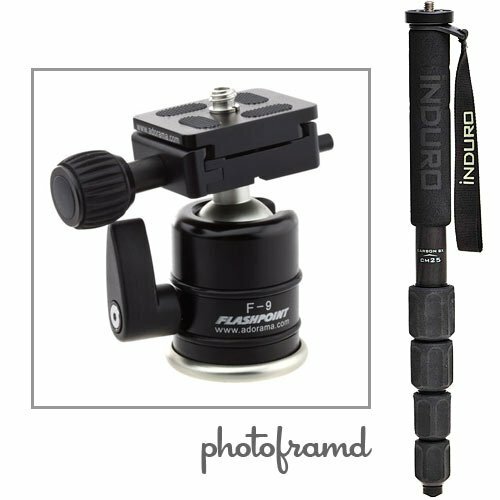 Flashpoint F-9 Compact Tripod Ball Head with Quick Release. This compact ball head is made of magnesium alloy which is 30% lighter than standard materials but strong enough to support over 40 lbs of camera gear! Made of magnesium alloy, this Flashpoint Ball Head is 30% lighter than standard materials and features smooth operational movement with positive locking. The included quick release plate has a safety catch to prevent accidental release. Head Load Capacity 40 Lbs. Put these two together and you have a compact monopod with head under 20 inches, weighs less than 2 lbs yet supports 22 lbs of gear! This combo is a full 5-inches shorter than my old monopod and less than half the weight! Having used this combo on a few outings now, I can say that it is sturdy and very quick to set-up and stow. It’s strong enough to even through over your shoulder with the camera attached when you need to change locations, even with the Sigma 50-500mm lens attached to the Canon 7D with battery grip! The monopod’s large rubber leg locks with non-rotating legs segments are a pleasure to use, and the head is secure enough to handle the large lens with no creep. After raving about this combo to Adorama, they decided to offer the combo as a “kit” for the discounted price of $149.95 with FREE shipping! If you ever thought of purchasing a monopod, this is your chance!